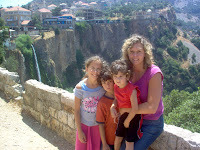 During the summer of 2006 I was in Lebanon with my husband and three children visiting family. We were having a lovely vacation filled with mountains, beaches, caves, waterfalls, sunsets, rainbows, castles, shopping, and parties. Then with no warning, a war broke out between Israel and a terrorist organization (or upstanding, community oriented, political faction—according to the smiling roadside signs). The closest Hezbollah camp lay about two miles from my husband’s little Christian village of Aabra in the heart of the Islamic South where Jesus once walked. Right away we heard the bombs and felt the house shake. Women sat on the porch painting their nails. Some old men dealt cards and drank coffee. Children played soccer on the sunny streets. This was Lebanon after all. You could hardly put things on hold for yet another war, and since neither Hezbollah nor Israel had a gripe with the little Christian village, people painted nails, played soccer, and drank coffee. Later that evening we went to a party. When we heard a particularly seismic bang, they told the children someone had set off fireworks for the birthday celebration. My husband took me aside and informed me it was the bridge to Beirut. Beirut and the airport. The way out. They always bombed it first to cut off the South from supplies. I didn’t enjoy the cake so much. A trapped sensation began to squeeze my chest. On the way home I watched red rockets shoot into the sky. Not in celebration of Clara’s birthday. Teens lined the streets watching them like fireworks anyway. That’s when I realized: although no one had a gripe with the neutral little village, sometimes innocent bystanders get caught in the fray. Hezbollah rockets flew willy-nilly across the sky after streaking Israeli jets, not at all concerned where they landed. I watched the flares apex and arch and spin back down to earth, without a care. The rockets. Not me. That night I kept my children in an interior room of the house. Thank God Lebanese homes are made of stone. I prayed and sang worship songs and read Psalms on the vibrating bed to the whistling flute and booming bass drum of rockets blasts, until I couldn’t take it anymore. My eleven-year-old daughter Christiana picked up the Bible and continued. Here is a portion from the scripture she found. 1-5 God, get me out of here, away from this evil; protect me from these vicious people. All they do is think up new ways to be bad; they spend their days plotting war games. They practice the sharp rhetoric of hate and hurt, speak venomous words that maim and kill. After a while the kids fell asleep, but I could not. I struggled to calm my racing heart, to still my shaking hands, to swallow back my fear. I stroked their curly heads as they lay in peace, treasuring each child, each moment, the tranquil features of their small faces. Finally, in the wee hours of the morning I crawled to my own bed on the side of the house where the rockets zoomed. I didn’t care anymore. I was desperate to escape into dreams. And panic set in. I could no longer hold it at bay. It seized my heart, clutching it, cinching tight, threatening to smash the life right out of it. I could barely find the air to breathe. My husband spent the day on the computer and the phone. I curled in a ball and cried and tried to keep the kids from playing soccer on the sunny streets. My daughter read us Psalms. Where to go? What to do? This was no child’s game. We were truly trapped. Should we go to Syria? To Jordan? Take a taxi? Steal a car? I couldn’t spend months in that village listening to bombs drop. I would never survive. Besides, there were things waiting for us back home, dance camps and church picnics, homeschool planning and season tickets to amusement parks. This was not my life! No good solutions surfaced, but we had to do something. My in-laws wanted us to stay there in that—can’t eat, can’t sleep, bass drums rumbling, must keep the kids from playing soccer on the sunny streets—hell. They’d been through wars before. We’d be trapped but safe. They seemed certain. But I couldn’t. I couldn’t do it. I couldn’t just sit and drink coffee on the balcony while waiting for my nails to dry. While waiting for the war to pass and the bombs to cease. Everything within me cried out to fight. I called my kids and husband to the interior room. It was the most peaceful place in the house. We sang and prayed some more. I asked the children if any of them had a word from God. Lord knew I was far too much of a mess to hear. Adam, not quite four-years-old, piped up. “I do,” he said in his squeaky little voice. He proceeded to tell us the story of a boy who wandered away from home and ended up in a library. As he described it, we could picture the two sets of double doors and the foyer in between. The boy entered the first set and got stuck there. He couldn’t go in, and he couldn’t get out. We didn’t know at the time that back home people were experiencing similar visions and dreams. But when Adam told us the story, we felt we understood. The library represented man’s wisdom. If we did what seemed wise, we would be trapped. I couldn’t be trapped again. I couldn’t stay trapped in that village any longer. Now, you have to understand traveling north to Beirut was the stupidest thing we could have done. The Israelis were on a mission to bomb out all the bridges and shut down transportation, and to get to Beirut would mean crossing many, many bridges. But as my husband spoke those words, a peace settled over the room like a soft snuggly blanket. We knew. We had our answer. I knew. I wasn’t trapped. My mourning was done. The world was light and bright again, and I didn’t care about the crashing bass drums. I washed off my tears and went to eat some food for the first time that day. My mother-in-law was furious and shouting at me in Arabic. “Don’t leave. Stay here. It’s safer here.” Mafais shi, she said in her own language. It’s nothing. I had been married for thirteen years at this point, and I always pretended I didn’t understand my mother-in-law in such moments. But this time I stood up and yelled back. In Arabic no less. “This is the right thing to do. I know it. Look at me. I’m not crying. I can eat. I’m happy. This is my family. These are my children. We’re leaving. And you can’t stop us.” I’m sure my Arabic was broken, and I messed half of it up. I’m probably not remembering the words quite right. But you get the point. And so did she. 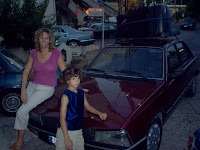 Gathering up our suitcases, we smashed into an old car along with two of my nieces who longed to return to their parents in the city. We drove up and down the mountains looking for paths where bridges still crossed the streams. As we gazed at the sky and listened for whistling rocket flutes before speeding over each one—I felt free. Free and at peace with God and the world. Oh, and the car broke down for a few minutes somewhere along the way, but I didn't mind. I just sat on the hood and smiled. Almost four-year-old Adam was right. If we tried to get out of the country we would have been trapped at the border for days. And the borders were being bombed. Instead we piled into a two-bedroom apartment with my brother-in-law’s family in Beirut. It was crowded, but I felt free. I spent the next week hanging out at the local hamburger joint with a play place, swimming at an uncle’s high rise luxury condo, and watching my favorite American television shows in English or French. All the while, I tried to convince my parents back home that we were fine. Because, you see, over 1,200 civilians died during the war in Lebanon in the summer of 2006. Understandably, my parents were trapped in their own—can’t eat, can’t sleep, bass drums rumbling, must keep the kids from playing soccer on the sunny streets—hell. Thousands of Americans were praying for us by this time. I got emails from old college buddies. My mother became close friends with our local congresswoman, Thelma Drake. Hi, Thelma. What’s up? And although I empathized with my parents back home, I had discovered a secret in the midst of the war. Sometimes in the middle of being trapped, you can wind up feeling oddly…free. When the US government finally announced they would send refugee ships, we were a five-minute drive from the departure spot, precisely where we needed to be. Adam’s vision proved true yet again. God had spoken. God is always speaking if only we will stop and listen. He had been our hiding place. Our refuge in that storm. I have more great stories about mobs and two days roasting on a concrete bridge and my kids being passed over the heads of US Marines. I'll have to share those another time. 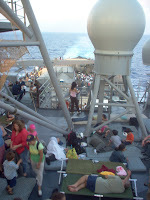 But finally, we sat on the deck of the USS Nashville watching the Lebanese skyline slip past. Feeling the cool Mediterranean breeze under the clear blue sky. We slept right on the deck under the stars. That might be my favorite night ever. There’s something great about being trapped in a war. Something that leaves you oddly…free. Back safe in the states! So what's your scariest vacation memory or worst vacation ever? Please, readers, go to Dina's book chapter through the link above. Dina, even though I've read this story before, it still had the same impact. And my heart was again in my throat. Beautifully told. What a blessing. I believe God will use this story today to touch someone's heart, someone who needs to remember that God has peace for them but it might not be where they're expecting to find it. Thanks for the vote of confidence, Deb. The full chapter on my website is titled, "Trapped in Time." It relates this experience with being trapped in the physical universe of time and space and how we can find peace while still here on earth. And just for record, I'm glad you got back safe and sound, Dina! I agree with them, Dina. I read this in your book, but even so, it was a gripping, awe inspiring read the second time around. I am so thankful you came through it safely and praising God all the while. Amen, sister. For a scary or bad vacation memory...I remember a few years ago my mom and I went to Disneyland and while we were there, they had tornado warnings. We had to rush back to the hotel and get behind a secondary wall. It was unreal. In Disneyland! But the tornados didn't come through there, thankfully. Another time, and this wasn't a vacation, I was taking my son to Bellingham, which is about an hour north of us, and about half an hour south of the Canadian border. It was March 15th. It was a beautiful sunny day. Before we were halfway there, the sun disappeared and there was a white-out. I don't drive in the snow. And, for the record, we don't get snow like that hardly ever. Especially in the middle of March. There was no where to turn around. I had to drive for another half hour on a winding, steep highway until I could turn around. My son and I prayed out loud the entire way, and to say my knuckles were white would be an understatement. But God was with us and the car never slid. Incredible story, Dina. I'm sure it was no fun to go through this, but it's the sort of thing that a family looks back at as a time that established their faith. Oh, they already believed, but now they know. They've acted on their belief. Thanks so much for sharing. Roseanna, boring has its upside. I'm glad we made it back safely too. Those sound like some scary situations too Susie. Thank God for his protection. Lisa, it was not fun at all, but I don't have any regrets. It was a wonderful learning and bonding experience for our family. very useful read. I would love to follow you on twitter. By the way, did any one hear that some chinese hacker had busted twitter yesterday again. that is amazing! I am utterly impressed with the relationship you cultivated with the Lord among your young children. God bless your son! It seems so timely a story with the Haiti crisis. I am sure you know how those poor folks feel over there. Trapped, anxious, desperate for the Lord to give direction and relief. It defies our American understanding when good people suffer. Beautifully told story. Praise God for the happy ending! Kathleen, I've been working on this post for weeks, so I hadn't even thought of it in relation to Haiti. But you are so right. Thank you for pointing that out. No matter where you are or what is going on around you, the safest place to be is in the center of God's will. I have no doubt we will hear of many miracles coming out of Haiti as we always do in such times of crisis. Hubby spent 6 months in Bosnia. He was a CAF Peace Keeper with the UN. As Military Policeman, he was sent in to investigate mass killings and other atrocities. He wrote home about walking out of a building and having it blow up behind him. Of having to ID people with no faces. Of being shot at while zipping down 'Sniper's Alley' in a soft-bodied jeep. Of being told to wear his flak jacket on the flight because of the artillery fire on landing. Only problem was - his crew hadn't been issued them yet. I wonder who was scared more - him on the landing or me reading about it. I will keep those letters for our children and their children. 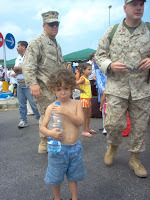 I can't imagine being with my children in a war zone. On my own, I'd be scared but would do what I needed to do. But as a mother with childen, my reasoning shatters when they're in danger. I don't take chances with them as I would by myself. I salute your and Dani's courage to do what needed to be done to get out safe. For listening to that gut instinct that I've come to realize is usually God's voice. Thank you for sharing your story with us Dina. I haven't read any part of your book but I will someday - you can be sure of it. Dina, I too was blessed by reading this. Such a powerful story, and what a testimony to God's provision and grace. I also enjoyed all of your photos-- great shots, all of them, and they really added to the story. Kathleen, this is indeed a timely piece, in light of the crisis in Haiti. What a good reminder to pray for the victims and those who can help, especially the missions agencies already in Haiti, like Compassion, World Vision, etc. Not a vacation scare story, but we went through a tornado in Oklahoma once. (Quite a short period compared to your lengthy ordeal, Dina!) We were traveling across country so my seminarian husband could work in a church internship. After we checked into a motel, we ate in a diner and noticed that the sky looked like a bloody bruise, black clouds with green and red and purple around the edges. I'd never seen anything like it before. By 8 pm the tornado hit. We had the tv on in the motel, and the weatherman instructed particular neighborhoods to take shelter, including ours. We got into the bathtub with pillows and bedding over us until the all-clear siren rang. God protected us, but I admit I was terrified. The tornado ended up picking up a train and dropping it a mile away or something, but the only damage we sustained was from the large hail pummeling our little Honda! Anita, Lebanon is pretty scary in general. I realized later, though, that what upset me the most was that sense of being "trapped" there. The other issues on my mind were what if we got separated or someone got hurt. The idea of death didn't really bother me, it was more the idea of my children suffering in some way. I'm certainly glad God was extra gracious in speaking to us in a way we could hear and providing us with the peace we needed. Susanne, some of the pictures were ours, but the ones of major devastation and bombing I found online. They are from that summer in Lebanon, though. 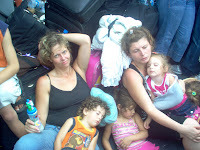 My husband did a lot of aid and humanitarian work once we arrived safely at the refugee center in Cyprus. That's it's whole own long story. But, yes, we definitely need to be praying for Haiti right now. Oh, and I lived in Oklahoma for four years. I don't have any great tornado stories myself, but my brother did some storm chasing there. What an AMAZING STORY of God's provision, of life in the seam of a different culture, of your ability to trust and obey! The most obvious one is when we took our 4th and 1st grade children on an "easy" hike which seduced you with one-runged steel ladders nailed into the frame, then progressed to terrifying, hanging-onto-the-rail-or-you'll-fall-to-your-death climbs. As I stammed to hubby, "We've gotta go back," he answered, "Going down is much, much harder. And there's a path through the woods at the top." ONLY through the grace of God and hubby's strong hands and chest did the two petrified of heighters in the family get to the top. Exuberant that we were alive and flushed with a sense of accomplishment, we cannonballed into the cool Maine lake. Laughed. Swam. Floated. I looked across the emerald green water at something red, black, pulsating toward us like a PacMan ghost. My screams vaulted everyone from the water. When we told our story later at the B&B, the innkeeper confirmed my suspicions. "Blood-suckahs, aye. Leeches. Got 'em everywhere here." From then on, we stuck to the Atlantic for our watery activities!!! Patti, your vacation story sounds scary but fun. I guess having little ones with you always puts things in a different perspective. Wow! Quite the adventure coupled with a sense of God's presence! A number of years ago, I went alone on a short-term missions trip to Sri Lanka, a country filled with war and soldiers. I actually never experienced any of the war while I was there although I saw soldiers everywhere. On the way home, I'd scheduled a few days R&R in Hong Kong. I landed just before a major typhoon hit Hong Kong -- an 8 on a scale of 10. Instead of connecting with my friends that first day, I stayed at a Baptist pastor's home (long story) with a number of other stranded people. Two things that stand out: someone had prayed over me before I left that I would not experience fear on this trip and in so many ways that prayer was answered! Secondly, most of my prayer support team for the missions trip stopped praying (or reduced their praying) when I left Sri Lanka thinking I'd be safe in Hong Kong!! Little did they know!! The whole missions trip and time in Hong Kong showed me so many things about being a missionary! A valuable trip!! Elaine, Lebanon is similar in that you always see soldiers walking around with machine guns. Stray bombs from time to time aren't that unusual. All of that stuff scared me during my first trip, but 2006 was our third trip, and I was used to that. It took several hours before we realized this was a serious conflict. Up until then, everyone was just sort of curious but not at all upset. Dina, my "scary" vacation and snow stories are absolutely nothing compared to what you went through. I can't even begin to imagine. Truly. And I do think it was so obviously God working through your son to give you a message. That was just amazing. It gave me goosebumps when I read it. My brain was just too tired this morning to verbalize all of that. I know a little bit about what it feels like to see soldiers walking around with machine guns. I worked for 9 years on a military base. When I first started working there you could just drive on the base to work, no problems at all. Then they had the bombing of the navy ship the USS Cole. All of a sudden, there was a 100% check of each car each time they went on the base. They just looked inside with a flashlight (if it was dark) and always checked your ID. Then, after 9/11, things changed even more. Not only was it a 100% ID check and visual exam of the inside of the car, but they would take these long poles with mirrors and inspect the underside of each car. But the unnerving part of it all were the security guards wearing machine guns. And even more unnerving were the tanks sitting beyond the security gate with their guns pointed directly at the spot your car was sitting while they checked your ID. I'm thankful for that kind of security, but it took quite a bit to get used to it. That is an incredible story. It fascinates me. You said: "Now, you have to understand traveling north to Beirut was the stupidest thing we could have done. The Israelis were on a mission to bomb out all the bridges and shut down transportation, and to get to Beirut would mean crossing many, many bridges." So if I'm understanding correctly you were at peace because you felt this was God's leading? The picture of the bridge being blown up is really scary. I think you guys are incredibly brave. I can feel the sense of relief being on the ship. I have to admit I'd be afraid to go backt there. And I love the Messag version of Psalm 140. That's amazing. My scaries vacation? Probably driving down to Florida with a bunch of other college students when a tire blew in the middle of the night and we came to a stop facing oncoming traffic. But that's nothing compared to your adventure. Will you go back to Lebanon? Jill, yes, basically we did the stupidest thing possible, but felt at peace because we felt sure we were following God's leading. Will we go back? That's a complicated question. We are willing to go back at this point, although it took a few years to get to that place. Right now, though, the family on both sides feels it's safest for us not to visit. That's why my in-laws came here over Christmas for the first time in 16 years. Suzie, the first time I arrived in Lebanon I was 25 years old with a nine month old baby and stepped off the plane to be welcomed by rough looking soldiers in camo with oozies. I was terrified! But by the end of the trip, I jumped out of the car to have my picture taken with some Syrian soldiers with their guns in my bright red mini-dress. That's a classic. Beautiful post, Dina. My jaw hit my desk at least three or four times! The thing that struck me (besides your bravery!) was your willingness to gather your family and trust that anyone of them, even the littlest, could, and would, hear from heaven! We've raised our kids that way too, and it has proved to be a genuine blessing more than once. No scary vacation stories... but my parents loved to do all sorts of exciting (read: terrifying) things while I was growing up. Like canoeing down the Colorado River, sailing on lakes so cold you have hypothermia within 60 seconds, and flying a small plane through the mountains. We only ran out of gas once... the propeller had just stalled when my dad realized the plane had two fuel tanks and he just needed to flip the switch (I had the label on the emergency beacon memorized. I was 8). I think they used up all my adrenaline before I turned 12. Niki, I admit I fully expected one of the older children to have a word from God. But when the baby spoke up, it was just so clear. I guess God gave me faith that He would speak to us that way. I didn't fit it into the post, but one of his teenaged Sunday school teachers back home had a dream that Adam was stuck in a library and in danger and she was trying to help him. Weird, huh. And that's pretty funny about your parents and vacations. I think I'd like your parents. Reading this post brought back all the memories. I lived in Lebanon during the 16 years of civil war and one day during the war I asked a friend of mine to travel with me from one area to another and his mother was so upset and sick worry. I was thinking to myself that this is crazy and way over protective. When the war broke out and I had my family with me I totally understood the feelings of my friend's mother. This time I had my family with me. Beside words of comfort and prayers I can not promise my family that I will be able to protect them from the flying bombs and bullets. It is way outside my abilities. By the end, God's sovereign power protected us and they all did excellent considering the situation. 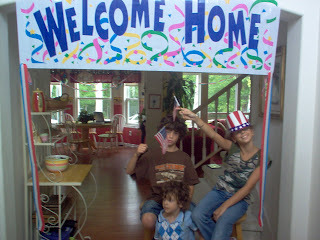 Looking at the Welcome Home picture reminded me that home is where your heart is. Great job Dina. Proud of you and love you. Although we would have never intentionally chosen to be in this situation, I think it was important for the children and I to understand how Dani and his family spent much of their lives. Probably also important for Dani to gain a more mature understanding of war. He has way too many cool adventure stories of covering the war as a cameraman for CBN news :)He and his old friend Charlie were regaling us with some of them over Christmas.